Oscar season is upon us, and I’ve come to the realization that there hasn’t been a post yet on this year’s nominations. As a result, I’ve brought along my good friend Agnes Wong, an avid watcher of all films (seriously, she’s on a completely different level), for her thoughts on all things Oscar-related. From the biggest snubs, to the lack of diversity and thoughts on a couple of Best Picture nominations, she’ll be telling me her thoughts on this year’s stars. When the 87th Academy Awards Nominations were revealed last Thursday, the Academy was hit with wave after wave of criticism for the lack of diversity in its nominations. While it’s well known that the Academy isn’t exactly known for its diversity in culture, race and gender, it was a surprise that they’ve decided to travel back in time for 1998. This year, every acting nominee is white and male (except for the mandated female categories, but let’s be real: they would be male if the Academy could have its way) with no women nominated for for their work as directors, screenwriters and cinematographers. 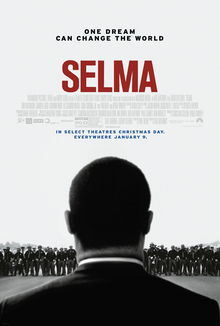 The biggest surprise, however, was the snub of David Oyewolo and Ava DuVernay for their work as star and director, respectively, of the critically acclaimed film Selma, a docu-drama/historical drama of Martin Luther King’s campaign to secure equal voting rights through the epic march from Selma to Montgomery in 1965. This post is going to be long-winded and wordy, but it’ll try to cover a majority of the most popular films that have been nominated. I highly recommend familiarizing yourself with the nominees, which can be found here, before reading. I’m shocked that it only received two [nominations], one for Best Picture and one for Best Original Song. It’s not often that something like this happens and I think we all know why. [Selma] was getting rave reviews (pretty sure it got 100 fresh reviews in a ROW on Rotten Tomatoes) and the director, Ava Duvernay, and the lead actor, David Oyelowo, was singled out for praise. However the Directors Guild Awards also snubbed Duvernay which was a really bad sign and then she didn’t show up in the Oscar Nominations either. This is the 10th time I believe that a film directed by a woman has been nominated for Best Picture without also getting a Best Director [nomination]. Had Duvernay been nominated, she would have been the first black woman to receive a Best Director nomination. I know people are going like “well maybe the academy just didn’t like the film” but come on lets be realistic here. The academy is made up mostly of old white men (pretty sure you can find actual statistics, it’s like 77% male and 90-something percent white I think). It’s just bizarre that it would receive a Best Picture [nomination] without recognition of ANY of the other people who worked on the film (except for Original Song). People say “ohhh you should judge a movie based on it’s quality not it’s politics” but I don’t entirely agree; films don’t exist in a bubble where it doesn’t engage with real life politics in any way. I really feel like there’s no way to objectively judge a film like a Selma without also thinking about it’s position in a larger context. If we ignore that, we cheapen film to just entertainment and we don’t [really] want that. 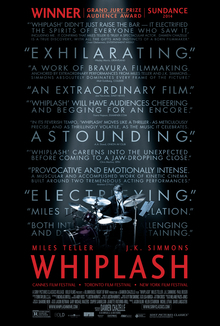 It’s more of a psychological study of the characters; the music part itself could be replaced by pretty much any other art form (although the director Damien Chazelle and Miles Teller are both drummers themselves and went HAM on getting the technical stuff right). But it’s not your typical sports drama. Without giving away spoilers, it’s a film that makes you uncomfortable in more ways than one. Simmons’ performance is incredible. I literally felt physically anxious every time he was on screen. His approach to teaching his students is terrifying, and there are moments when it ventures straight into [abusive] territory. But you learn that while yes, he’s a [jerk-y] teacher, he’s not just one for the sake of being one — he has a purpose. The film poses questions like: How far is too far? Is this method of approach successful? Is it worth it to pursue greatness even at the cost of your relationships, your sanity, [and] even your happiness? The editing and sound mixing (particularly during the drumming scenes) are also incredible and really heightens the tension. Miles Teller did most of the drumming himself (it’s obvious it’s not a double). Ok enough about Whiplash and onto Boyhood, the current Best Picture frontrunner. We all know about the ‘filmed over 12 years’ thing which is pretty incredible. Richard Linklater is a director who strays away from the Hollywood scene and is an expert on crafting films that feel intimate (see: his Before trilogy — Before Sunrise, Before Sunset, [and] Before Midnight), and boyhood apparently manages to capture those moments of intimacy wonderfully, despite being large in scope. Although it’s been fantastically well received so far, there’s been some backlash against this film because on the outside, it looks like it’s trying to embody the “American experience” of growing up, but obviously it’s focusing on a white middle-class kid so that’s not representative of every American out there. I haven’t seen it myself so I can’t talk much about what issues it tackles and in what level of detail BUT I will say that despite Linklater being a middle aged white guy who’s had a head start in the film industry because of that, he is actually quite an unconventional choice for a director [nomination]. The Academy usually doesn’t recognize these low-key indie films. Here’s a great article about this on a film website called The Dissolve that’s written respectfully and intelligently. So yes, Linklater’s [nomination] is a step forward for recognizing different modes of filmmaking though not for racial politics or anything. Totally ambitious and meta filmmaking. It’s a bit hard to describe; it’s not like any other film I’ve seen. It’s about high brow VS low brow art, about authenticity, about technology, about real life VS art, and so many other things. It was filmed to look like most of it was done in one long take, which is astoundingly impressive on a technical level and not gimmicky either, although it won’t be apparent until the end. Edward Norton and Emma Stone deserve to be singled out for praise too. BUT I have a few problems with some of the film’s social commentary; it comes off as a little “millennial-hating” sometimes (hard to explain without giving much away) and condescending. The dialogue sounds very self-indulgent sometimes, like it’s a bit in love with itself. But overall, it’s a very ambitious screenplay and I admire what it tries to do. I think a worthy Best Picture nominee. Winner? [I don’t know], as I haven’t seen all the nominees, but I’d be ok with it. As for American Sniper, I haven’t seen it but like… why was this even made. Why did it get a 90.2 million box office opening (not that that’s relevant to the Oscars but…). I cant say anything about the film itself but I feel like the people who [want to] see this just [want to feed their patriotism] and seeing [multiple shooting scenes]. There’s been quite a bit of backlash as people have unearthed lines from the memoir of the guy Bradley Cooper portrays which say that he “enjoyed killing people”. It’s been kind of a dark horse and has only gained momentum recently. No one expected it to get 6 Oscar [nominations]. Marion Cotillard (Inception, The Dark Knight Rises) snuck in the 5th best actress spot for a small french film called Two Days, One Night, knocking off Jennifer Aniston for Cake which had been receiving some buzz and Amy Adams for Big Eyes (the Academy is in love with Amy Adams). One Oscar nominee that wasn’t talked about is Foxcatcher, which you can watch from January 16-19 through Western Film, our university’s very own movie theatre! For times and more information, you can visit their website. The Oscars will be airing February 22. What are your thoughts on this year’s nominations and frontrunners? Let me know by commenting below!